While attention over the past year in the Asia-Pacific has been focused on developments in the South China Sea — in particular China's ongoing island-building efforts and expansion of coast guard activities — a new and potentially more destabilizing “normal” has set in around the East China Sea between China and Japan. This “normal” sees China's air and coast guard forces penetrating Japanese airspace and territorial waters near the disputed Senkaku/Diaoyu islands with increasing and sustained frequency. By most accounts, Japan's air force and coast guard assets have thus far succeeded in monitoring and deterring China from the types of adventurism that Japan fears might escalate to conflict. Over time, however, Japan's ability to consistently counter the threat from China will be under increasing pressure and adjustments in Japanese military force composition and interoperability between military and civilian bureaucracies are necessary to address the challenge. Simmering tensions between China and Japan in the East China Sea came to a head on September 11, 2012 when the Japanese government purchased three of the disputed Senkaku islands — claimed by both China and Japan but administered by Japan — from private owners. The purchase was in part prompted by threats by right-wing Tokyo Governor Shintaro Ishihara (PDF) to develop the islands, which the Japanese government worried might have upset relations with China. Soon after the purchase was announced, street protests broke out across China followed by strongly-worded Chinese government statements delegitimizing the purchase. 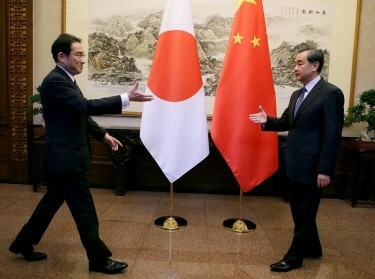 Beijing, however, was intent on signaling to Tokyo that actions speak louder than words. From China's perspective, Japanese actions were a flagrant and arrogant violation of Chinese sovereignty necessitating sustained Chinese military expressions of jurisdiction and power. In the days that followed the purchase of the islands, two Chinese ships, Haijian 46 and Haijian 49 of the China Marine Surveillance, penetrated the 12 nautical mile territorial seas of the Senkakus. China's actions were to become a precedent for an intensified penetration campaign into the Senkaku contiguous zone territorial waters by Chinese maritime law enforcement vessels. By the end of 2012, the Japan Coasat Guard (JCG) reported that China coast guard (CCG) ships had intruded into Senkaku territorial waters 68 times since September 11, an unprecedented spike in intrusions from previous years. The campaign continued, with 188 vessels penetrating the territorial sea in 2013, 88 in 2014, and 86 in 2015. During this multi-year period, the CCG penetrated the territorial seas of the Senkakus with an average of 7-10 vessels a month and penetrated the contiguous zones with an average of 70-90 vessels a month. On the basis of reporting from China's State Oceanic Administration (SOA), the same 20 or so CCG hull numbers appear to be responsible for patrolling the Senkaku Islands, ranging in size from 1,000 to 4,000 tons. Over this period of time, CCG behavior followed a predictable pattern of penetration, with transits into the territorial seas usually lasting a few hours and CCG officers maintaining communication with JCG officers to avoid miscalculations. 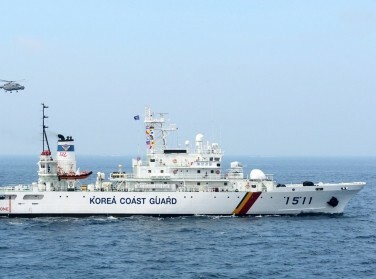 There were very few instances of CCG vessels loitering, dropping anchor, or arresting Japanese fishing vessels within the 12 nautical mile territorial waters that might compel JCG officers to undertake more aggressive measures to repel the CCG vessels from the vicinity. It appeared China was more intent on demonstrating sovereignty through presence rather than on provocative actions against JCG vessels. 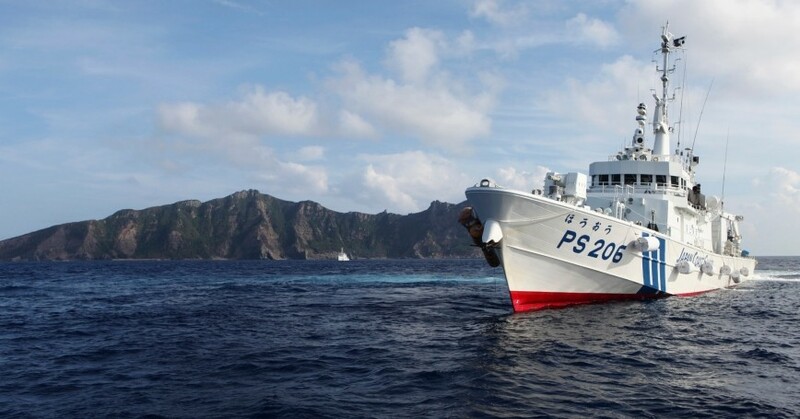 However, incidents such as those that occurred between 5-9 August 2016, during which 200 to 300 Chinese fishing vessels and 15 CCG vessels penetrated and loitered inside the contiguous zone around the Senkaku Islands, greatly challenged the JCG's capacity to respond. The scenario offered a stark lesson in Chinese inundation tactics, which, if employed in the future, might overwhelm Japan's ability to bring sufficient assets to the scene. Then in December 2015, China sent its first armed coast guard vessel into the territorial seas of the Senkaku's, elevating the stakes. Since that time, there have been sustained entries by armed CCG vessels into the territorial seas, which from China's perspective was simply balancing the equilibrium of armaments. Until December 2015, China argued, Japan would shadow unarmed CCG vessels with armed JCG cutters, putting China at a disadvantage. China took note, and has since commissioned CCG cutters based on the type 054 “Jiankai” II frigate hull frame, armed with 76mm auto-cannons. Compared to other coast guard vessels of this size (3,500 tons), these new Type 818 CCG cutters represent the most potently-armed cutters in the region. Recent photos from Chinese sources also indicate even smaller-sized CCG cutters (~2,500 tons) are also being equipped with 76mm auto-cannons. In other words, China appears committed to out-gunning JCG assets in future scenerios. Of the hundreds of vessels that penetrated the contiguous zone of the Senkakus during the August 2016 fishing incident, the JCG reported that over 100 “maritime militia” were identified onboard the vessels. It is believed many of them, according to JCG officials, were commanding Chinese fishermen as captains of the fishing boats and were clearly identifiable, wearing military fatigues or naval uniforms. China is believed to boast the largest contingent of maritime militia in the world. The term “maritime militia” characterizes fishermen and crew of civilian ships who receive military training or are under some type of military command and control arrangement, and who carry out military support activities aboard fishing vessels when required. They typically accompany civilian fishermen during the fishing season and receive a daily allowance and training from local maritime militia organs on land as reserve military personnel. China is believed to boast the largest contingent of maritime militia in the world, with several bases scattered along the coastline of Zhejiang, Fujian, Guangdong and Hainan Provinces facing the East and South China Seas. Fishing vessels with maritime militia aboard are typically equipped with the Chinese equivalent of a GPS navigation system called “Beidou,” and most ships come equipped with radar, high frequency radio communications and tablets. Such equipment allows maritime militiamen to exchange information with nearby Chinese Navy ships and Coast Guard vessels in real time. One Chinese article, summarized by Andrew Erickson and Connor Kennedy, describe the role of maritime militia in this way: “Putting on camouflage, they become soldiers; taking off the camouflage, they become law-abiding fishermen.” Such sources demonstrate their usefulness as military-trained civilians whose role is to act as front-line defenders of Chinese maritime rights and interests in disputed territory in the East and South China Seas. The introduction of maritime militia disguised as civilian fishermen near the Senakus creates a new and destabilizing dynamic for Japanese policy makers. The imperative of plausible deniability requires JCG officers to act cautiously when confronting civilian Chinese vessels with presumed (and possibly armed) maritime militia onboard. On the other hand, Chinese fishing vessels manned by maritime militia may feel emboldened to challenge Japanese sovereignty over the Senkakus, to include possible attempts to land on the disputed islands. Doing so would compel JCG officers to adopt counter-measures in response to Chinese assertive actions which may involve opening fire on non-compliant vessels who fail to heed warnings to cease a course of action. The blurring of civilian and military command over civilian assets adds a new wrinkle into the conflict escalation equation that Japanese officers and policy makers will have to grapple with in the future. Undermining Japanese territorial integrity around the Senkakus by Chinese maritime law enforcement vessels is not the only challenge confronting Japanese officials. China has also stepped up its air activity in Japanese airspace in ways that Japan regards as destabilizing. Some of these penetrations involve flyovers of straits and waterways of Japan by Chinese aircraft during training exercises through the Western Pacific, and others involve the transit into the territorial airspace of the Senkakus by Chinese government and civilian aircraft to demonstrate Chinese sovereignty. December 13, 2012: State Oceanic Administration (SOA) Y-12 patrol aircraft violates Japan's territorial airspace over the Senkaku Islands for the first time. Similar SOA patrol aircraft have penetrated the territorial airspace of the Senkakus 13 times since that time. January and August 2016: PLAAF ELINT (Y-9) and AEW (Y-8) aircrafts pass through airspace of the Tsushima Strait (PDF) for the first time. August 2016: PLAAF H-6K bombers were identified passing through airspace over Tsushima Strait for the first time on its way to the Scarborough Shoal in the South China Sea. Since 2013, PLAAF H-6 bombers flown between Okinawa and Miyako islands an estimated 14 times. September 2016: PLA fighter jets were identified passing through and Okinawa and Miyako Islands multiple times. As a result of such activity, the sortie rate, operations tempo and resulting maintenance requirements of Japanese Air Self-Defense Force (JASDF) aircraft have increased substantially, greatly stressing capacity. Close-in encounters between JASDF and Chinese aircraft have also increased, heightening tensions and the possibility of accidents in the air. In May and June 2014, for example, 2 PLAAF Su-27 fighters reportedly flew “abnormally close” to JASDF aircraft (PDF) during routine patrols, according to JASDF sources. Data on JASDF scrambles reflects a clear trend of increasing Chinese air activity within Japanese airspace. JASDF scrambles in response to Chinese activity have increased steadily since fiscal year (FY) 2012 (PDF), for example, with scrambles in FY2016, when fully reported, most likely representing the most on record for the JASDF. Between FY2012-2016, JASDF fighters scrambled 306 times in 2012, 415 in 2013, 464 in 2014, 571 in 2015 and 644 in the first three quarters of fiscal year 2016. When the final quarter of FY2016 is compiled, the number will most likely exceed 1,000 scrambles, which would surpass the record of 944 scrambles in FY1984 during the Cold War, according to an official at the Defense Ministry's Joint Staff Office. Most of the air penetrations from China occur in the Western and Southwestern sections of Japan's Air Defense Identification Zone, near the Senkakus and Okinawa Island. The Japanese government has acknowledged the challenge it faces from China in the East China Sea and has begun to invest in infrastructure and personnel projects to address long-term trends. On the civilian side, the JCG established a special Senkakus patrol unit of 600 JCG personnel to deal exclusively with patrolling the Senkakus. The unit is based on Ishigaki Island, where a private pier and lodgings have been built for the unit. Ishigaki Island is some 170 kilometers from the Senkakus — a much shorter transit than from the main island of Okinawa (410 kilometers away), which houses a larger JCG headquarters. The Senkaku special patrol unit will utilize 10 newly-built offshore patrol vessels (OPVs) ranging from 1,000-3,000 tons, all equipped with 20mm guns, water cannons, and some with a flight deck for helicopters. Two 4,000–6,000-ton high-endurance OPVs are also part of the unit but are based at nearby Naha Island due to pier constraints at Ishigaki. The unit has also developed innovative practices to ensure continued operations of the vessels. The JCG has instituted a “multiple-crew system,” for example, in which four crews are assigned to three ships, as opposed to one crew for one ship. Since all three ships can be operated by any crew, if one crew is on leave, another crew can operate the ship without disruption to operations. In total, two groups of four crews for three ships has been formed, totaling six ships by eight crews, thereby increasing the utilization rate of an extra two ships that would normally be idle due to crew leave. Japan has also commenced one its largest build-up of ground troops, missiles, and facilities on the southernmost islands of Miyako, Ishigaki and Yonaguni Island in response to increased Chinese penetrations in the Southwest island chain of Japan. The first initiative calls for permanently deploying 500 Japan Ground Self-Defense Force (JGSDF) troops on Ishigaki. 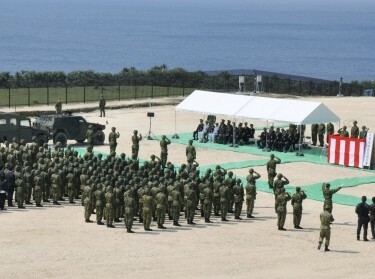 The second initiative involved the construction of a radar station on the remote island of Yonaguni, accompanied by 150 JGSDF troops, in March 2016. This marked the first time that a self-defense force facility was established in Okinawa since reversion to Japan in 1972. The third line of effort is the deployment of missiles and 800 troops on Miyako and 600 troops on Amami Islands by the end of FY2018. According to Colonel Masashi Yamamoto, military attaché with the Japanese embassy in Washington, the buildup is part of a“three-phased” approach to contingency planning for escalation of tensions around the Senkakus. “Phase Zero” entails the deployment of intelligence, surveillance, and reconnaissance assets near the Senkakus, currently under construction. “Phase One” would involve the deployment of a JGSDF “rapid-deployment” regiment consisting of infantry, mortar, and mechanized companies equipped with amphibious vehicles, to buttress the existing JGSDF assets and personnel stationed there. Finally, “Phase Two” would see the activation of such units in the event that the islands were seized by an enemy. Finally, in 2014 the JASDF established a new permanent squadron of E-2C Hawkeye AEW aircraft on Naha Air Base off Okinawa to increase early warning detection of foreign aircraft and vessels. These aircraft will complement the new squadrons of Lockhead Martin F-35A fighters to be delivered and deployed in Japan over the coming years. China and Japan are engaged in a long-term test of wills over disputed waters and territory in the East China Sea. The sovereignty dispute is, at its heart, a symptom of a much larger and more systematic competition for influence in the region driven in part by unresolved historical grievances and mistrust. China appears intent on sustaining its air and coast guard activity within Japanese administered territory, and doing so in ways that challenge Japanese jurisdiction but that fall below a threshold that might elicit a military response. Due to the close proximity in which coast guard and military forces operate in the East China Sea, the potential for accidents and inadvertent escalation is ever-present. It is in neither country's interest to go to war over what is essentially a peacetime competition over sovereignty and influence, yet due to the factors mentioned above, forces pulling each country into conflict will be difficult to overcome in the event of an accident involving the government or military forces of either country. Japan could continue to reorient its national security strategy and mindset to reflect the new security situation it faces in these grey zone-type scenarios. Such a reorientation will involve a more robust training architecture between the JCG, JMSDF and JASDF bureaucracies and personnel. Situations will in all likelihood arise in which the JCG will be unable to handle Chinese inundation tactics. Under these situations, Japanese government and military bureaucracies must be prepared and feel comfortable operating in a shared command and control environment. While the JCG and Japanese military have experimented with joint training and exercises, much more is needed if Japan is to feel confident in deterring grey zone threats of the future. Daisuke Yamamoto, “Reliance on the Japan Coast Guard Right Up Until an Imminent Contingency — Endless War of Attrition With China Coast Guard in Tense Stand-Off Over the Senkaku Islands” Tokyo AERA in Japanese, 28 November 2016. Lyle J. Morris is a policy analyst at the nonprofit, nonpartisan RAND Corporation. This commentary originally appeared in The Diplomat on February 24, 2017. Commentary gives RAND researchers a platform to convey insights based on their professional expertise and often on their peer-reviewed research and analysis.